Me at Bray Studios in England the home of Hammer Films. probably end up on this site). Along with my friend and fellow collector Sam we have been busy over the past few decades collecting posters, stills, autographs and even meeting many of the people who made or starred in many of the films I loved as a kid. This site is for collectors like myself who may never have seen many of the posters here but would like to know what they look like (that's if they ever turn up for sale), basically a reference guide. I hope it helps, there are pages on Hammer posters as well as Tigon, Amicus and many other classic British horror and fantasy films. lot of the time the poster or some kind of pre-production artwork came first. prepared to show how the poster would look. During production some stills would be provided and a final design would becompleted combining these reference stills and the initial poster design for a final release poster to be prepared. A good example of this is “Taste the Blood of Dracula” below. Top left is pre-production artwork by Tom Chantrell used in trade ads. 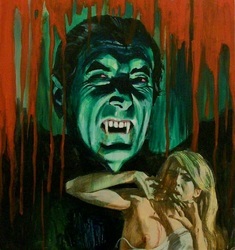 There is no face of Dracula on this artwork as Dracula wasn’t even meant to be in the story, this was later changed but by this stage it was proving difficult to get Christopher Lee to sign up. In the middle is Tom Chantrells initial poster design before being provided with reference stills from the film, one is chosen to be used on the final design for the release posters by Tom Chantrell. Have you ever wondered why there are so many posters around for "Dracula Has Risen From The Grave" and the 1969 reissue for "One Million Years BC / She" well here is the story. 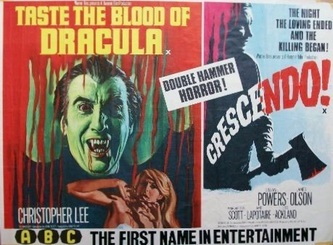 Hammer were one of the first film companies to give away posters to fans who wrote to the company and the fans received these two posters and 3 “action stills”, actually 8x11 prints not photos, of Christopher Lee, Raquel Welch and Ursula Andress. 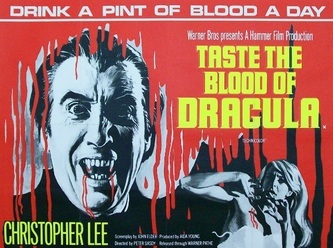 I don’t know how many people wrote to Hammer but they were still using the posters a couple of years later when promoting “Blood From the Mummys Tomb”. Evenually the posters made their way onto the open market and were a common site at the fledgling movie fairs. A story I was told by a London poster dealer illustrates this were he remembers around 130 unfolded "Dracula Has Risen from The Grave" quads on a dealers table most of which were bought by a dealer from Germany. These are 2 lovely posters and ideal for starting a Hammer collection as they are affordable and easily available but they are not and never will be worth a lot of money as there are just to many about. I hope this hasn't depressed to many people, anyway please take a look at the many pages of other Hammer and horror posters on this site.